We’d love your help. Let us know what’s wrong with this preview of VIP by Jen Calonita. Twelve-year-old Mackenzie "Mac" Lowell's dreams have come true. Thanks to her mom scoring the coolest job EVER, Mac is going from boy band fanatic to official tour member of her favorite group, Perfect Storm. Good thing she's brought along her journal so she can record every moment, every breath, and every one of lead singer Zander Welling's killer smiles in written detail Twelve-year-old Mackenzie "Mac" Lowell's dreams have come true. Thanks to her mom scoring the coolest job EVER, Mac is going from boy band fanatic to official tour member of her favorite group, Perfect Storm. Good thing she's brought along her journal so she can record every moment, every breath, and every one of lead singer Zander Welling's killer smiles in written detail and daydreamy doodles. To ask other readers questions about VIP, please sign up. Have you ever been absolutely in love with a boy band? And then you discover you get to meet them because your mom is their new manager?! Not only that, you get to go on a road tour with them!? Well, that is exactly what happens to Mac in I'm With the Band. As far as she is concerned she is Perfect Storms #1 fan. Of course, drama happens and it is up to Mac to save the day! Oh my goodness people, this book is so much fun! I am well over the intended age range for this book (it is a middle grade no Have you ever been absolutely in love with a boy band? And then you discover you get to meet them because your mom is their new manager?! Not only that, you get to go on a road tour with them!? Oh my goodness people, this book is so much fun! I am well over the intended age range for this book (it is a middle grade novel), but I still found myself enjoying it and totally pulled into it. Sometimes I even felt like I might be a 12 year old! And when a book can totally make you forget your own age, that is when you know it is good! Obviously with saying all of that, I thought that the characters were well done. I felt like I was reading a 12 year old. I could tell Mac was in love with the boy band and it reminded me very much of real 12 year olds in the same situation. I'm pretty sure if you have a 12 year or so old in your life that is love with a boy band that they will not have any sort of problem relating to Mac. Also, Mac is not all about being in love with the band. She also has a very creative artsy side. This is actually shown in quite a fun way too! The story is told from Mac's perspective as she writes about the events in her journal/diary. So her art work is doodled along the edges and also she has a comic that she writes that is pretty much her alter ego that gets shown and referred to a lot in the story. It really is quite fun and really adds to the story. Definitely a great and super fun read! Perfect for 12ish year olds or for those who want to forget their actual age! This review is based on a copy provided by the publisher in exchange for a fair and honest review. All thoughts and opinions are my own. Who can resist boy bands? Certainly not Mac who has been a huge fan of Perfect Storm (PS) before they were a hit. Mac knows everything about them -- from eating habits to favorite colors -- and dreams of going to her Spring Fling dance with the lead singer, Zander. But when a sudden turn of events causes Mac's mom to get hired as PS' tour manager, Mac will not only get to daydream about the band, she will spend the next two months with them 24/7. Will this personal encounter change her image of t Who can resist boy bands? Certainly not Mac who has been a huge fan of Perfect Storm (PS) before they were a hit. Mac knows everything about them -- from eating habits to favorite colors -- and dreams of going to her Spring Fling dance with the lead singer, Zander. But when a sudden turn of events causes Mac's mom to get hired as PS' tour manager, Mac will not only get to daydream about the band, she will spend the next two months with them 24/7. Will this personal encounter change her image of them? What if Zander is not so dreamy as she pictured in her head? I thoroughly enjoyed this book. Although, I did find it a little lengthy for Middle-Graders at first, I soon began to see various drawings, blank pages to separate chapters, and graphic novel entries (Mac's alter ego), encouraging me to quickly changed my mind. Mac was heartfelt and quirky/clumsy making it easy to get attached to her character. She also acted like a mature twelve-year-old. Aside from the romance, the author added Lola, a rich spoiled fifteen-year-old ready to challenge Mac's favorite fan status. I don't know why the "I'm with X famous people" stories feel like a throwback these days, given that they still have a lot of life in sports books for kids, but I'm With the Band, the first entry in a new middle grade series, does both feel modern while also feeling like a throwback. It follows the tale of a girl, Mac, and how she is a major fan of a pop band that is touring. Her mother is hired on as the tour manager, and suddenly everyone is going on tour with the band. Mac gets to know the ba I don't know why the "I'm with X famous people" stories feel like a throwback these days, given that they still have a lot of life in sports books for kids, but I'm With the Band, the first entry in a new middle grade series, does both feel modern while also feeling like a throwback. It follows the tale of a girl, Mac, and how she is a major fan of a pop band that is touring. Her mother is hired on as the tour manager, and suddenly everyone is going on tour with the band. Mac gets to know the band, lessons are learned about perception and reality, and we see some real growth in the characters on a whole. 5+ stars! SQUUEEEEE!!! Um, oops, sorry, but this book is just too adorbs, and I loved each and every bit of it!!! Before I start with all the good stuff, I want to mention that the blurb is pretty much lying. She doesn't really see the guys as her brothers, her love interest is just moving to another boy, because she finds out Zander isn't what she thought he was, and she finds that, and more, in another member. Secondly, that part about the band breaking up? Over an argument? Mac having to save t 5+ stars! SQUUEEEEE!!! Um, oops, sorry, but this book is just too adorbs, and I loved each and every bit of it!!! Such a shame. I am still happy I read the book, but yeah, my expectations were slightly different thanks to the blurb. Now to the good stuff, because there is a lot of good. First up Mac, or Mackenzie. She is a supersweet, cute, cool 12-year old girl who loves Perfect Storm and gets the chance of her lifetime when her mom (who works with bands/artists) becomes the tour manager of Mac's fav band. I loved how Mac was first totally fangirling, but later on started to get more comfortable with the band, and with everything that involves them. She could talk more normally to them, and they to her. It was a relief to see her change. I was a bit worried that she might be stuck in fangirl mode the whole tour. Not that such a thing would be that bad, but I was definitely looking forward to her interacting with the guys, and not just stammer and shake a can of energy drink and spray it all over her favourite guy (and yes, this happened). I loved how creative she was, and it was great fun seeing her drawings pop up all over the place. My favourite would definitely be her comics. Yes, there are comics spread throughout the book, not a lot, but I didn't mind, each time I saw one I was squealing in delight. Her shift from one boy to the other was all right with me, it wasn't an immediate switch, no, it was gradually done, and I was squeeing and cheering for these two. They make a cute couple, and I hope they will get together in the next book. Though I guess Mac's mom wouldn't be happy with it, but oh well, all for the greater good of shipping these two together. It was fun to see how well she and Jilly matched. I was worried at first that they might not go together, but from the start I knew this would be a true friendship, just like Mac had with her other friends Scarlet and Iris. I was cheering for Mac during the Lola parts. My word, Lola was annoying. Luckily Mac isn't one to just stand there and let it happen, she really stood up for herself. Go girl! Yay! The author definitely did a great job at writing Mac. I could definitely believe this girl was 12. This may sound weird, but I have read enough books that had a character as x age but it never felt like they were that age. But not with Mac, oh no, she gave off 12-year old vibes. I am not sure how to explain it correctly, but she felt like how I was when I was 12. I could go on and on about Mac, but I think I got most of the important parts mentioned. I just couldn't see what everyone was liking about Zander. He was cute, and he was nice, but he was also a player, and wanted all the attention. Sure, we do see some sweet moments, but at times I really just wanted to smack him on his head for being such a prick. Like when he invited Mac for a pool date, and just invited the entire fanbase, and didn't even make the food he promised he would make. That is just one example, but I have a few others. I can imagine why Mac may have changed her feelings from that boy to another one. Every girl loves him, but they don't know him. Not really, and Mac is really getting closer with him. And again, he is a sweet guy, but I can't see him go with just one girl in the future. Heath, my favourite of the whole bunch, I loved how energetic, fun, happy he was. His fake tattoos were cute, I do wonder if, when he is old enough, he will be taking real tattoos, or if he will just keep his sleeves. I loved how sweet he was with his siblings, and the whipped cream fight was just absolute brilliance. Kyle, ah, Kyle. My second favourite of the band, well as soon as he started opening up a bit. Then I could see that he wasn't that cold, but instead was a sweet guy with a love for comics. Out of the guys he was also the sweetest with Mac. He really helped her out some times. I am sure you want to know who Mac picked. Hehehe, I won't tell you that. Oh no, you will just have to read the book yourself, my lips are sealed. The only thing I will tell you that I was already hoping she would pick that guy. He was a much better match. Then we have Jilly, Iris, Scarlet. Mac's three friends, and I loved all three of them. Iris and Scarlet were exactly like Mac with their fangirling, and it was adorable when they visited in a later part of the book. I already missed these girls, so it was fun to see them go completely bonkers about the band (just like Mac had in the beginning). Jilly, the only one who doesn't really care about the band (or at least not in a fangirl way). I immediately took a liking to her, and she stayed a sweet, supporting girl the entire book. Mac's mom was also really cool, I loved how caring she was, but how she was also strict when it was needed. She was always there for Mac, well, whenever she had a moment in between her busy schedule. She never neglected Mac, she always made sure to make some time for Mac if needed, and she always made sure to do something fun with Mac during her moments off. Of course at times she was a bit too strict for me, then again, it doesn't help if Mac is protecting people instead of just being honest about stuff. I still wish Mac would just have been honest at the end of the book about certain events. The tour, the trips through the country, it was so much fun to read. I loved seeing the sights that our guys and Mac and Jilly saw. It was fun to see Mac learn all sorts of things about touring, and how she got more and more experienced with how to handle a band and how to do stuff. The concerts and the meet-greets were also a delight to read. It was fun to see how craycray the fans at times were, and I loved to see how the boys handled that. They did a tremendous job at being sweet and caring. We also see the band practises songs, finding a new song, and I was happy we were able to see that process as well. How they also wanted feedback from others, and how Mac really helped out due to a certain thing she mentioned. The illustrations were top-notch, and I loved them all. I was already hoping the book would be filled with them, but I never expected so many and also comics! The style of the drawings was perfect, and I actually found out the illustrator also made Henchgirl, a book that I got pre-ordered. :P I was already wondering why the artstyle was so similar. Phew, I think I have everything I wanted to write. This book was 100% adorbs! It is a book that will make you laugh, will make you squee. You will be going on tour with one of the cutest newest bands in the book universe: Perfect Storm. Be sure to read this one! I would highly recommend it! My sister is obsessed with this series, guys. My sister is not a reader whatsoever unless my mom tells her to read, so her adoring VIP: I'm With the Band was something new and interesting for me because I am the reader in the house. Who would have known that she would get an obsession with Perfect Storm, a fictional band that features three cute guys who are around my current age, fifteen (almost sixteen!) and who kee This review can also be found on A Thousand Lives Lived, check it out for more! My sister is obsessed with this series, guys. 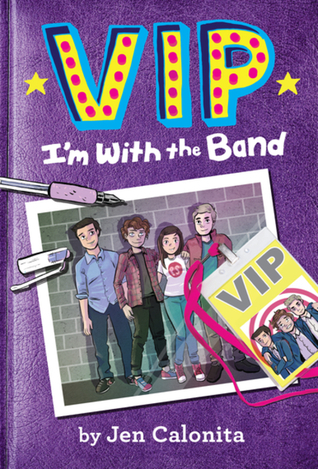 My sister is not a reader whatsoever unless my mom tells her to read, so her adoring VIP: I'm With the Band was something new and interesting for me because I am the reader in the house. Who would have known that she would get an obsession with Perfect Storm, a fictional band that features three cute guys who are around my current age, fifteen (almost sixteen!) and who keep getting into trouble. I seriously adored reading this first book of this series, and as I am writing this review, I am gearing up for reading the sequel. I am so excited to head back into the world (a few hours later after completing this) of Mac, Zander, Kyle, Heath and Jilly, characters who I now love for their different, fun personalities and how they seriously made this book comedic. VIP: I'm With the Band is exactly what you think it is, and perhaps a little more than what we all would presume, too. Jen Calonita, a frequently read author of mine, especially when I headed through my tween-cool-middle-grade phases when I was twelve, created a fangirl protagonist named Mac, or Mackenzie, who is the biggest fan of boy band Perfect Storm. Her and her two best friends, Iris and Scarlet, spend the beginning of the book trying to score tickets for Perfect Storm's show in Long Island the next day. They don't succeed, but Mac's mom surprises the three with tickets that she retrieved secretly. Mac fangirls, meets the guys, and has the best time of her life at the concert. The next day, her life changes once more when she discovers that her mom will be Perfect Storm's manager, and that she and Mac are going on tour with the band. I WOULD'VE FANGIRLED TOO. This book, as a whole, just made me feel happy. Mac was a happy heroine who just fangirled wherever she went and made the best of the situation. VIP is written through the perspective of Mac, obviously, but in a journal format which makes things even more fun for the younger audience. The illustrator, Kristen Gudsnuk, also did a fabulous job at showcasing her image of Mac and the gang. This is honestly such a cute book as a whole. After I finished reading, I told my sister that I will be rating this four stars out of five. She freaked out. "Why? I'm not talking to you anymore," she said. I'm not twelve, I cannot relate to this book a hundred percent. Back in my day, three years ago, I wasn't obsessed with any boy band. One Direction came a year later, but not at twelve. This was such a cute read, don't get me wrong, but it's completely unrealistic, because seriously, who in the world of entertainment (like Mac's mom) will get the chance to do what she does. IT'S RARE. And bringing her twelve-year-old daughter with her? That's extremely rare. I just inwardly wish that Jen could have focused a touch bit on realistic issues that are hinted at in the novel. For example, where is Mac's father? We all know that Mac's mother is single, because no man is ever mentioned and they wouldn't leave a father at home to go on the road, and that seemed important to me, since Mac is still young. I loved Mac as a protagonist. She had this carefree attitude, and I loved how she was striving to be mature around enemies like Lola. (I HATED THAT GIRL) Back to the unrealistic thing, the "romance" is completely unrealistic, as well. It is noted a few times that Zander, Mac's initial crush out of the three members in Perfect Storm, is fifteen years old. I'm fifteen, and I would never romantically pay attention to a seventh grader. I'm turning sixteen next month, so that's a different example. Okay, picture this: a ninth grader crushing on a seventh grader. Although you may not see it at first, it kind of happens. I like middle-grade to be realistic, knowing who the audience is. The story is fluffy, cute, and definitely entertaining where tween girls can learn about show biz (because it seems that Jen has experience with this after interviewing people), but there's the part where you know that girls won't learn anything from this: it's practically impossible to occur. Anyway. KYLE IS ADORABLE. HEATH IS ADORABLE. ZANDER IS... MEH. I loved Perfect Storm's attitude as a whole, but I loved Kyle and Heath the most. Zander is your ordinary, snobby member who is in it completely for the fame. We see how he wants the spotlight and all of the solos. *rolls eyes* I just cannot picture how a romance (or fling) could stem out of this series. I wonder what the next book will provide us with. "Seconds later Heath joined in. Zander was the only one without an instrument. I guess he doesn't need to play one when he has the voice of an angel. When Zander started to sing, I closed my eyes and listened without really trying to hear the words. It was always hard to catch them all on the first listen of a song, but I got the gist pretty quickly" (188). VIP: I'm With the Band would seriously be loved by any tweenage (haha that word) girl who loves contemporary and funny books. I am so excited to read the sequel (RIGHT NOW) and see how Calonita's writing continues and how the series unfolds. Will the romance happen? Will Kyle keep being my crush? I hope so for the latter. As an unashamed lover of boy bands, this book was a super fun read. I grew up with posters of BSB and Hanson on my walls, and I have all of the One Direction and 5 Seconds of Summer albums on my iPod. So, really, it wasn't a surprise to me that I enjoyed this book. A very fun (albeit predictable) book that I know my students will love. I will also be making a lot of adults read it because of reasons. Now, I must say this book is definitely for middle-grade readers, which is typically too young for my personal taste. However, the premise 'fan-girl tours with her favorite band' struck a cord in my long-forgotten pre-teen/teenage heart. I had a blast reliving memories of being a teenager and the summer I fell head-over-heels in love with the band members of *NSYNC. I can still remember wasting hours away daydreaming about going on tour with them and ridin I loved this book! I am totally biased, but I really enjoyed the story as well — even though there are ridiculously cheesy moments. I loved that the main character was a great artist with a fantasy similar to my own when I was younger (she wanted to create their album cover art and have them fall in love with her too!) and the main character was even creating this cool comic about her secret hero identity with her friends. I will absolutely be picking up the next book in the series! Twelve-year-old Mackenzie Lowell goes on the road with her favorite boy band when her mom gets a job as the band’s tour manager. This is such a fun series for any pre-teen or boy-band-loving girl! Mackenzie and her friends are obsessed with Perfect Storm, a group of three boys who sing catchy love songs and who are adorned by girls everywhere. For anyone who loves boybands, this will be a treat and will be familiar for what comes along with the territory of adoring a group of singers. Mackenzie Twelve-year-old Mackenzie Lowell goes on the road with her favorite boy band when her mom gets a job as the band’s tour manager. For anyone who loves boybands, this will be a treat and will be familiar for what comes along with the territory of adoring a group of singers. Mackenzie and her friends perfectly show and feel what it’s like to adore your favorite music group. This allows for such funny and exciting dialogue. The element that makes this series extra fun and exciting is how Mackenzie’s mom works in the music industry. This makes so many scenarios possible for the girls and their involvement with their favorite group. Author Jen Calonita got the idea to write these books from being a New Kids on the Block fan. You can definitely tell she uses her boyband loving experience in her books. Readers will end up choosing who will be their favorite member of Perfect Storm. **See reading timeline** I was right! Now..who owes me 30 bucks???? Huh. Oh well. AAAAANYwho, this read was GREAT. I mean, like, LEGIT THE BOMB. I loved it, and while I can't relate to Mac because I've never crushed on a band, I (almost) always find a way to disappear into a book. I couldn't put it down!!!!! WITH FIVE EXCLAMATION MARKS!!!!BOOM!!! REFERENCE POINT ACHIEVED. I LOVED this book! I would definitely recommend this book to Dork Diaries fans. It is about a girl who's mom gets a job working for the girls favorite boys band. For anyone who has ever had a crush on a star - music star, movie star, sports star - this story will recapture some of the swooning and hysteria of being a fangirl. Mackenzie and her two best friends, Scarlet and Iris, are crazy about the band Perfect Storm. They flip out when they get tickets and backstage passes to the concert. But what Mac doesn't know is that her mom has been chosen as the band's new tour manager and she is taking Mackenzie along on tour with the band. Squee! Traveling for For anyone who has ever had a crush on a star - music star, movie star, sports star - this story will recapture some of the swooning and hysteria of being a fangirl. Mackenzie and her two best friends, Scarlet and Iris, are crazy about the band Perfect Storm. They flip out when they get tickets and backstage passes to the concert. But what Mac doesn't know is that her mom has been chosen as the band's new tour manager and she is taking Mackenzie along on tour with the band. Squee! Traveling for weeks on the road and even sharing a tutor with the boys helps Mac to realize that they are talented, but they are also just teenage boys. They make messes, have food fights, and play pranks just like everyone else their age. This book has a lot going for it. The whole boy band and fangirl scene is very topical. Showing an inside glimpse of a band on tour is also entertaining; having to do homework even though you are a pop star, being on the road at all hours, having to plan your life around performances and appearances - it's not all as much fun as people think. And the relationships in the book have very realistic touches, whether it is a family like Mac and her mom, the "brotherhood" of the band members, or the friendships Mac develops with other characters. Calonita's writing is amusing and the illustrations capture memorable moments. The comic panels of Mac's imaginary alter ego, Mac Attack, are very amusing - especially the fact that she fights villains with a nail file. For middle grade and tween readers who would like to see what the life of a pop star is like, or for those who simply enjoy books about friends and relationships, I'm with the Band is an enjoyable read that will have you laughing out loud or shaking your head at some of the antics. I love Calonita's YA stuff—the Hollywood Life books in particular always seem like just the right amount of feel-good fluff—but I think I'm a bit far out of the age range for her MG books. Spent much of this one trying to remember whether I read this sort of thing when I was younger (the really fluffy, really cheesy things where they're all like 'omg boyz boyz boyz' but because it's MG the stakes are, like, 'will he hold my hand and let my mom drive us to the mall?? '), and...I must have? At some I love Calonita's YA stuff—the Hollywood Life books in particular always seem like just the right amount of feel-good fluff—but I think I'm a bit far out of the age range for her MG books. Spent much of this one trying to remember whether I read this sort of thing when I was younger (the really fluffy, really cheesy things where they're all like 'omg boyz boyz boyz' but because it's MG the stakes are, like, 'will he hold my hand and let my mom drive us to the mall?? '), and...I must have? At some point? But it's not really the kind of book that sticks with you. A-freakin'-dorable! Diary entries with scattered illustrations and a realistic pre-teen voice make this series starter impossible to resist. Mac, the self-declared #1 fan of the up and coming boy band Perfect Storm (ala One Direction) finds out that she will be touring with the band thanks to her mother's new job as their tour manager. Along with being tons of fun, this book also subtly reminds readers that celebrities are real people as well- with real foibles, strengths, feelings, and personalities. When Mac's crush on the lead singer starts to shift, readers will be cheering for her to find out where her heart really leads her. With action and sweetness that is completely appropriate for middle schoolers, I'd be surprised if this book spends much time on the shelves- it's more likely to be passed hand to hand by eager tween girls. this book was so good! i'm totally going to read this book again. i recommend this to any one and every one. i think it was my favorite book of 2016. An admirable attempt to write an MG boy-band romance, but it didn't work. It was definitely a "just ok" book (hence the two star rating). It was't horrible, but I didn't love it either. There are comics and artwork strangled throughout the book. The artwork added to the story, and the comics are a fun addition. Like most books with pop star and regular girl pairings, suspension of disbelief is a requirement. However, VIP: I'M WITH THE BAND was too outlandish. The main characters didn't f An admirable attempt to write an MG boy-band romance, but it didn't work. It was definitely a "just ok" book (hence the two star rating). It was't horrible, but I didn't love it either. A fun tween read. All Mac's dreams come true when her music exec mom is hired to tour with her favorite teen boy band. Suddenly Mac is rubbing elbows with the boys of her dreams. However all is not well with this group and hopefully Mac can help them remember why they belong together. This story had me feeling nostalgic for my NSYNC obsessed childhood. It was fun to see the behind the scenes antics of this band and to see Mac get to know her idols as people. VIP: I'm with the Band made me feel like I was a young girl again. Mac is such a great character you couldn't help root for her all the way through. Mac gets to travel with her favorite boy band. A dream come true! Now can she get over her nerves and actually talk to her major crush, the lead singer, and maybe get him to go with her to her first school dance? I passed this book on to my students. I know they will love it! I won my copy from Goodreads First Reads. From a literary standpoint, this book does not deserve four stars. The stars are strictly for my enjoyment of the novel. It has the feel of a Disney Channel movie and made me inner thirteen year old extremely happy. This novel is very gushy and not for everyone, but it was a fun break for me from the consistently depressing middle grade novels. I actually really liked this book. It was cheesy, and too young for me, but still, it was fun. It had some social drama, it had some natural consequences, and the main character learned that what you wanted once might not be what you want now. It was cute. I love this book. And not in an ironic way. It accomplishes everything it sets out to, and it does it well. Haters to the left. If your not into comic books you might be confused by some of the references but other than that it's a good book. Really cool love the middle start OK the end I didn't really get. I loved it! Such a super cute book. I hope she writes more about Mac Attack.